Homemade pop tarts are one of my favorite things to make. 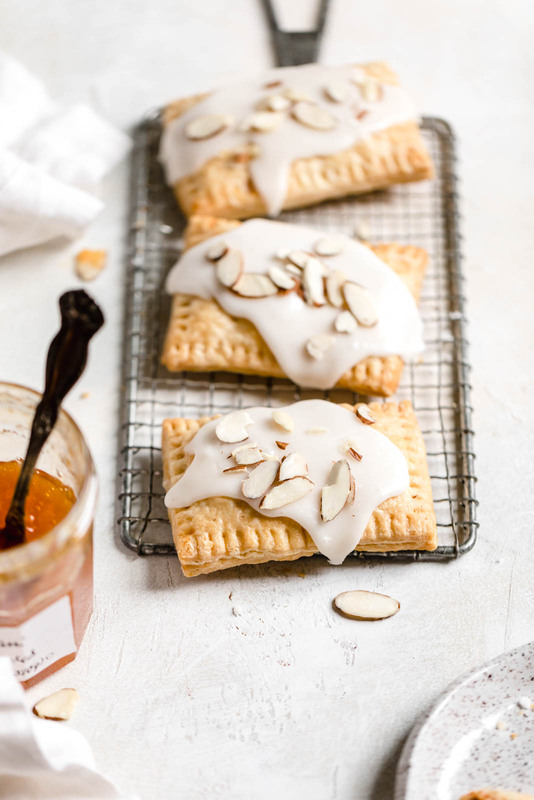 Of course, as a kid I loved store bought pop tarts in every flavor: strawberry, s’mores, brown sugar cinnamon… excuse me while I wipe the drool from my face. But now that I’m a proper adult, I actually prefer the homemade version of pop tarts. As in, a buttery, flakey dough filled with some sort of fruit jam, and topped with a powdered sugar glaze. 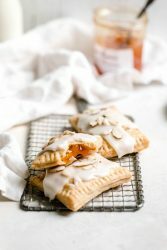 And when you think of it being those three ingredients- dough, jam, and glaze- the flavor variations for pop tarts from scratch are practically endless. In general, my favorite recipes are ones that take classic or traditional desserts, and elevate them with interesting flavor combination. And this pop tart recipe is no exception. It starts with a buttery homemade pop tarts dough, which is basically pie dough. Then I used my favorite apricot preserves in the center (perfect for this Middle Eastern Month that I have going on the blog! ), and finished it with an almond extract icing. Today’s recipe is for sure going down on my “winners” list for recipes I know I have to make again. Which, seeing as I make 3-4 recipes a week, is saying a lot. Last! Let’s talk about my tips for this recipe. For starters, I suggest making the pop tart dough the night before. Let it rest in the fridge, and take it out once you’re ready to get baking. I also highly recommend using a high quality jam or preserve in this recipe. Because there are so few ingredients, quality matters. I went with Bonne Maman apricot preserves, which are just lovely. Last, use a wooden ruler to measure your pop tarts, and cut the dough with a pizza cutter that you run along the ruler for crisp, clean edges. Alright, who’s ready to make pop tarts from scratch?! In a food processor, mix together flour, sugar, and salt. Pulse in cubed butter, pulsing until the texture resembles a corse meal. Pour in ice water, then pulse everything together until just combined. If dough is too dry and not coming together, add in another tablespoon of water. Form dough into 2 equal sized disks and wrap each with plastic wrap. Place in fridge for at least 1 hour, but up to 2 days. Remove one of the doughs from the fridge. Place a large piece of plastic wrap over a work surface, then sprinkle flour over it. Also flour a rolling pin. Working quickly, roll the dough out into a 10″x13″ rectangle. 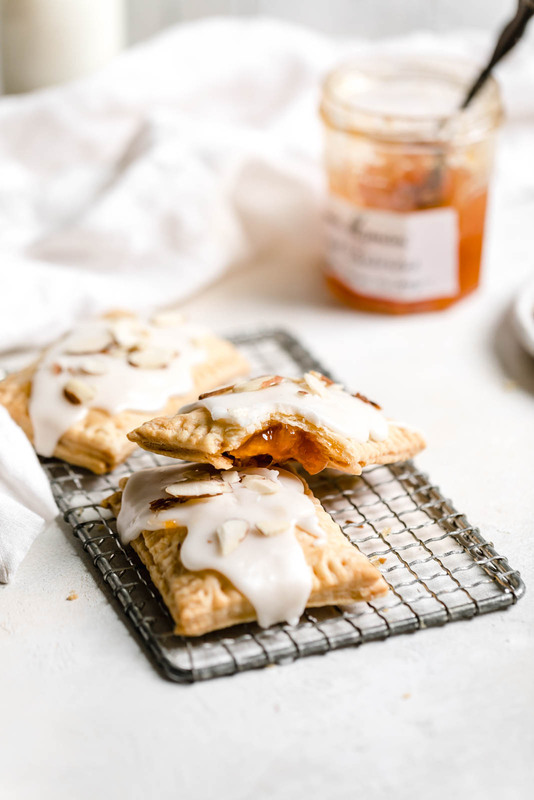 Spoon a rounded tablespoon of apricot preserves into the center of each pop tart base. Spread it slightly, but not too close to the edges. Once the pop tarts are baked, it’s time to glaze! Whisk together the powdered sugar, heavy cream, and almond extract. Heat in the microwave for 15 seconds to get the mixture more liquified. 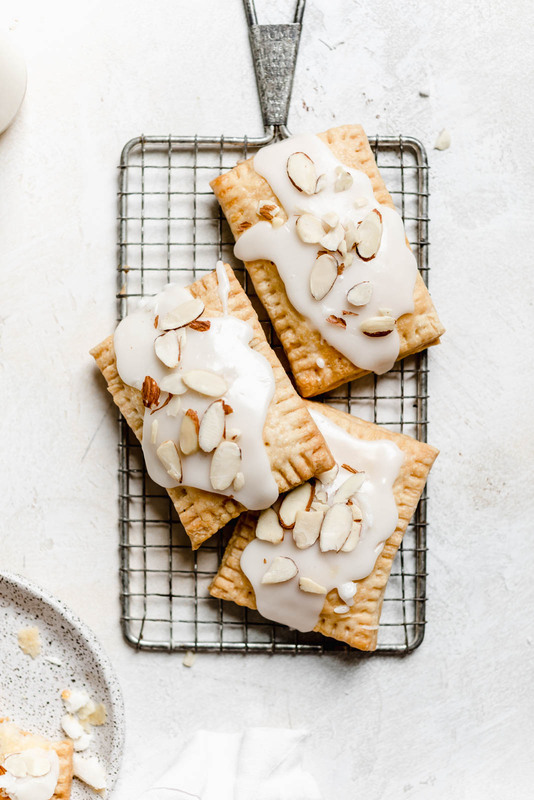 Spread the icing over the pop tarts, then sprinkle sliced almonds for garnish! Would like to receive blog posts! You can sign up for our email list in the right sidebar! 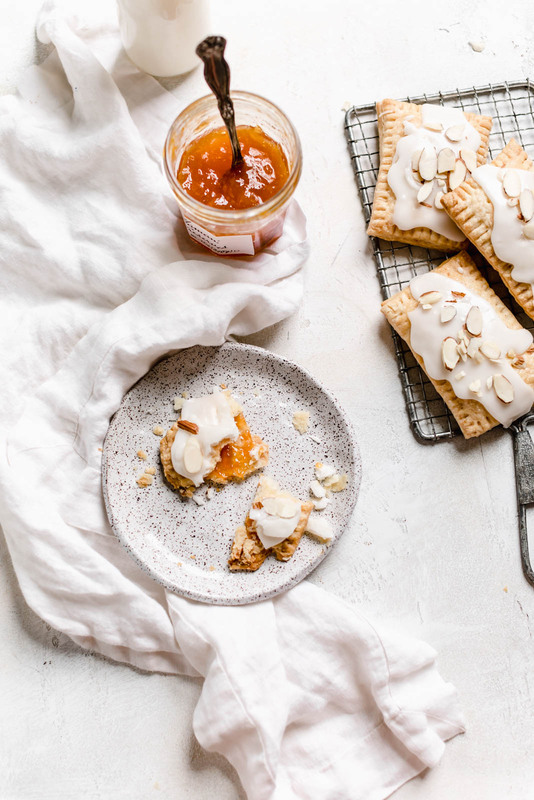 These look dreamy – Bonne Maman apricot preserves are the best! Ah! Bonne Maman preserves are the BEST!!! The apricot one in pop tarts sounds divine. Nothing better than homemade Pop Tarts! Love the apricot jam! I could eat these every morning, nothing beats homemade pop tarts! These pop tarts look amazing!!! These look amazing and I cant wait to make them! Quick question….how do you store the leftovers? Bonne Maman is the best! 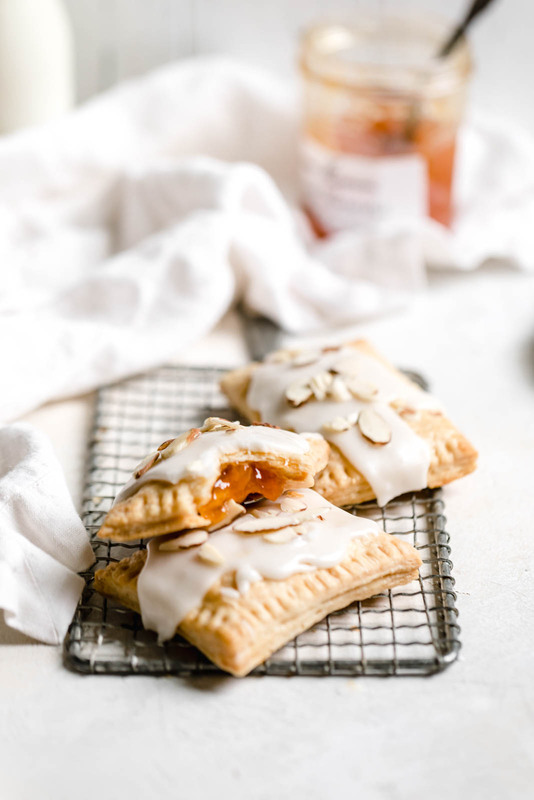 Absolutely love these homemade pop tarts! Mmmmmmm! Pop Tarts for grown ups! These are so nice! These are almost too pretty to eat. Almost. Just out of the oven, smelling incredible. I used Bonne Maman’s new Intense Apricot,better than the original! Apricot Almond sounds like the best flavor! What a great start to any day!